Brandon Heath is just about to release his third studio project, titled 'Leaving Eden'. The album's first single 'Your Love' has already climbed to number 4 on iTunes Christian Songs chart. Leaving Eden is an 11 track album produced by Heath's longtime producer Dan Muckala and again includes co-writes with the talented Jason Ingram (One Sonic Society) on four of the new songs on this album. Read More Brandon Heath is just about to release his third studio project, titled 'Leaving Eden'. The album's first single 'Your Love' has already climbed to number 4 on iTunes Christian Songs chart. Leaving Eden is an 11 track album produced by Heath's longtime producer Dan Muckala and again includes co-writes with the talented Jason Ingram (One Sonic Society) on four of the new songs on this album. There are two things Brandon does amazingly well. This man is a very talented songwriter, we saw this with his last album. You can tell Brandon takes time to craft his lyrics so as to tell you a story and it's always a story that you want to hear. This is no exception on his latest album, again many of the songs talk about issues and feelings and a theme that Brandon wants to sing about. He stated before the release of this album "I want to celebrate the goodness in the world, and that's what the rest of the songs on the project talk about. I feel like I have a choice to protect what little innocence is still left in my life, because I think that's what attaches me to God. It doesn't mean other things can't be healed, but why do I have to feel like I'm completely ruined, when I'm not?". An interesting topic to approach when writing a new album. The other strong quality of Brandon and his music is the live aspect of this songwriter. He has just finished co-headlining a 23 city tour with Jars of Clay, then he is straight back into a tour with TobyMac on the Winter Wonder Slam Tour playing over 17 cities. When spring hits us he is back on the road heading out with special guests Dave Branes and Kristian Stanfill for a month and once that is finished he will join up Mercy Me to play to an estimated 20 cities tour, this guy knows how to tour. This album starts off with the amazing title track Leaving Eden, and again the first thing that jumps out to you is the talent that Brandon has. He again has written a truly stunning song. In regards to style, Brandon hasn't really changed from the style of music of his last few albums What If and Don't Get Comfortable, strong acoustic led songs, but you can tell there is definitely a more mature sounding guitar style throughout the whole album. As the album progresses the songwriting skill of Brandon pours out, especially in the tracks Your Love and The Light In Me which are two radio friendly songs. You can see straight away why Your Love was the first single from the album, both have great melodies and a catchy chorus. Another standout moment of the album is softer song Only Water which is led on an acoustic guitar. In this song Brandon shows us his quality as a guitarist with his soft picking atmospheric guitar playing that show the quality of the man. During Only Water Brandon paints a very strong picture of how important water can be for people who don't have it, yet at the same time he uses water as a picture of being washed over and made clean, then towards the end he talks about Jesus' first miracle of turning water into wine, this is a very clever and beautiful song, which had to be one of my standout tracks. 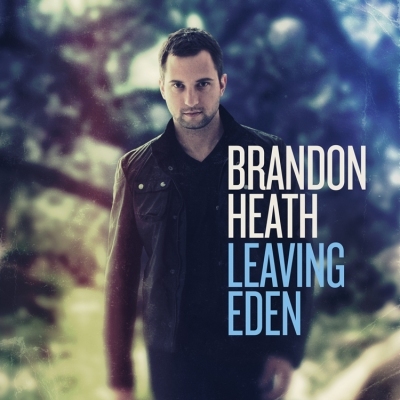 Leaving Edenis very a strong album from Brandon Heath, taking what he does best in songwriting and story telling and taking it to a new improved level. This album is full of great lyrics, great vocals and good guitar work. If you're a fan of Brandon I'm sure this will be a must have. If you have only just read about Brandon and his work this album is well worth looking out for.